According to the National Academy of Sciences, in 2008 the United States had a death-by-violence rate of 6.47 per 100,000 people. That is enough to make the United States rank first out of seventeen “high-income democracies” ranked in that category. 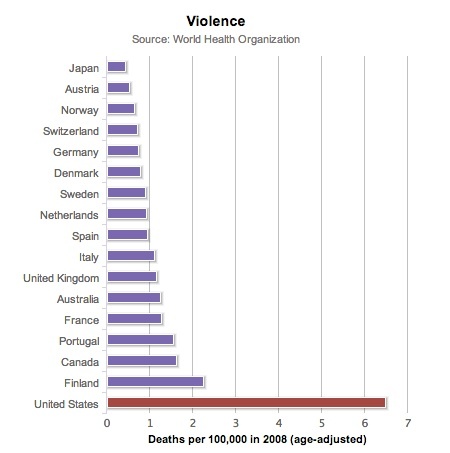 The second-ranked country was Finland, with a death-by-violence rate of 2.24 per 100,000. Unfortunately, not at all unexpected. Perhaps you have already done this and if so please direct me to the graph, but it would be useful to see a pie chart with the number of deaths from guns broken down by type of weapon, owned by assailant, owned by victim as well as circumstances of death: robbery, homicide, domestic violence, suicide, accident. There must be many other variables but these would be interesting. Really enjoy seeing these comparisons in graphic form. The “death by violence” rate ignores violent rapes, assaults, muggings, carjackings, maimings, kidnappings, arsons, domestic violence, and the like, perpetrated upon the defenseless by stronger predators (armed or unarmed). Ironically, it also INCLUDES self-defense killings as “bad” deaths. @Emancipator: If you follow the link, you’ll see that although the data may be from 2008, it was compiled by the WHO in 2011. As to why it was posted in 2013–well, this is pretty much a one person hobby and so data appears whenever I come across it and/or get around to posting it. @henrybowman: Yep, different metrics result in different ranks. That’s part of the point of this blog.